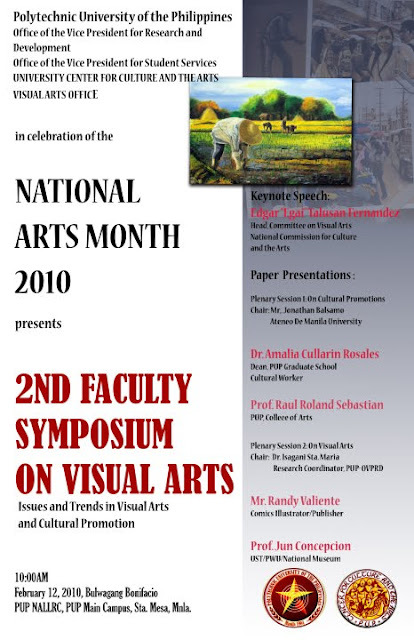 The Visual Arts Office, University Center for Culture and the Arts, Polytechnic University of the Philippines announces its 2nd Faculty Symposium on Visual Arts scheduled on February 12, 2010. The 2nd Faculty Symposium on Visual Arts will join together art educators, cultural workers, art students, artists and art professionals to discuss major issues and trends in visual arts and cultural promotion. The symposium will be centered on the theme “Issues and Trends in Visual Arts and Cultural Promotion”. The symposium will focus on the following specific topics: Digital Arts and Traditional painting; Commercialization in Visual Arts; Social advocacy and Visual Arts; Contemporary art movements; Philippine cultural heritage preservation and promotion; and Ethnic Visual Arts. The symposium is FREE. Registration starts at 9:00 a.m.
For details please call (632) 7137369 and look for Joseph Reylan Viray, Head, Secretariat.